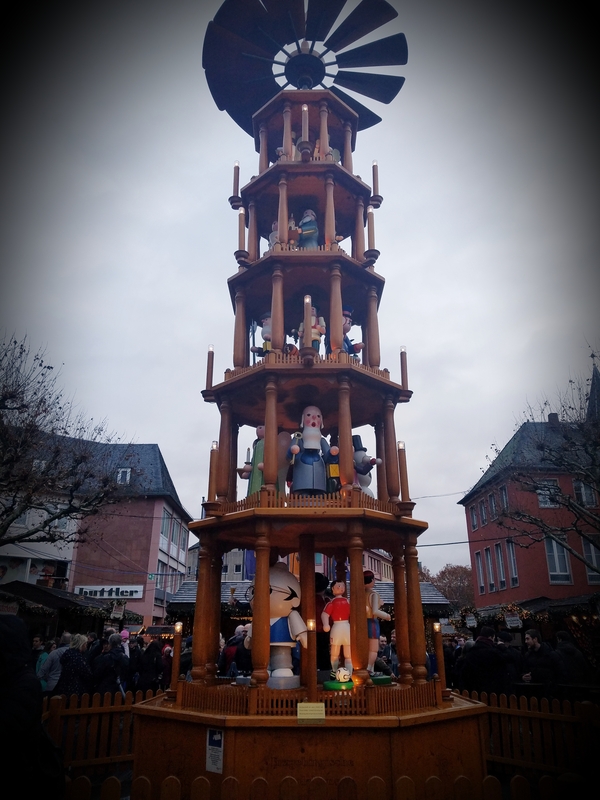 One of the many benefits of living in Germany is taking advantage of the numerous festivals and traditional celebrations throughout the region. Christmas (Weihnachten) Markets, or more accurately Advent Markets, pop up in nearly every town and city across Germany in the weeks before Christmas. 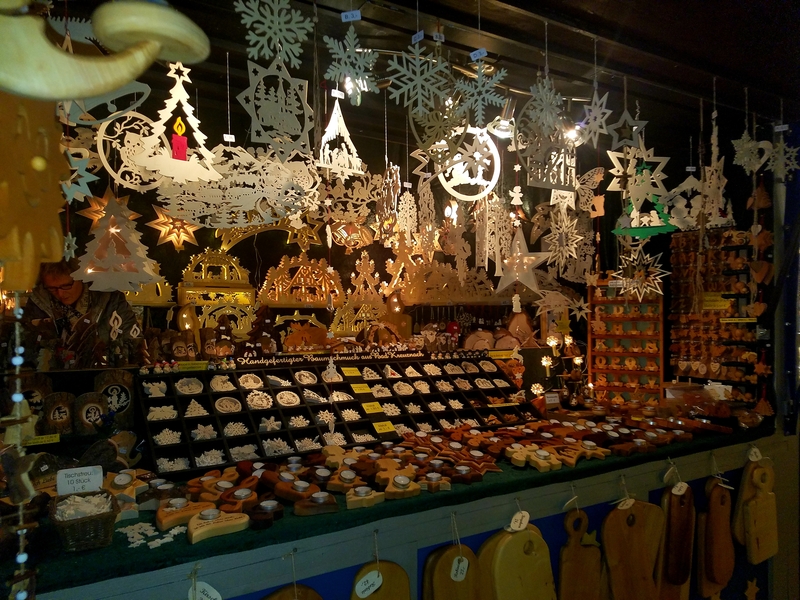 Hundreds of vendors peddle bakery items, wooden scenes and toys and hand-painted ornaments and of course Glühwein. Our family explored five markets this year. Each offered different experiences even though some of the booths offered similar wares. Depending on the city or town, the markets are centrally located or spread out throughout the city. In our city of Wiesbaden, the market stretches around the city square. In Cologne, we rode a miniature train shuttle to a few areas of the market. The various cities offer regional specialties. Nuremberg features its unique small sausages, which are served three in a bun, and spicy Lebkuchen (like gingerbread). 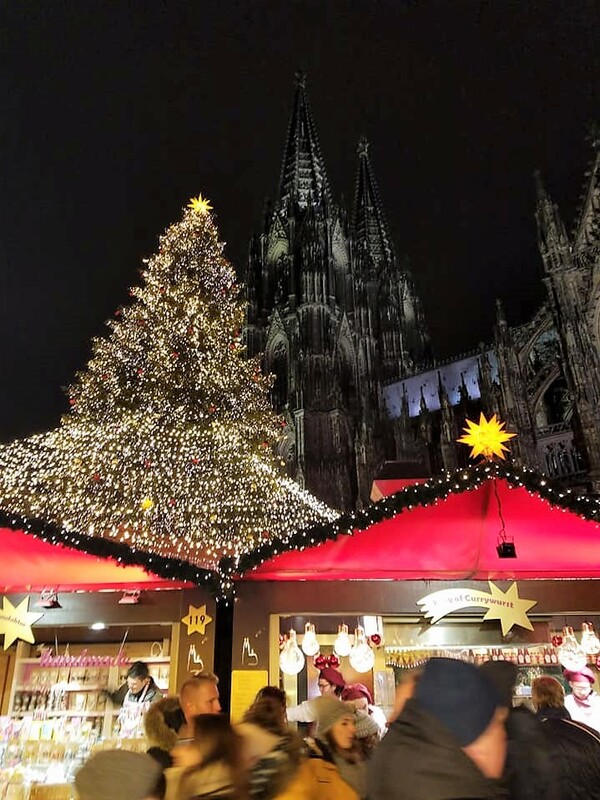 Cologne’s larger market allows for tasting your way throughout the areas with everything from smoked fish to candied apples. The larger markets provide different themes and even some sections special for children including rides and crafts. With so many markets in the area, it’s easy to explore and experience the diversity. 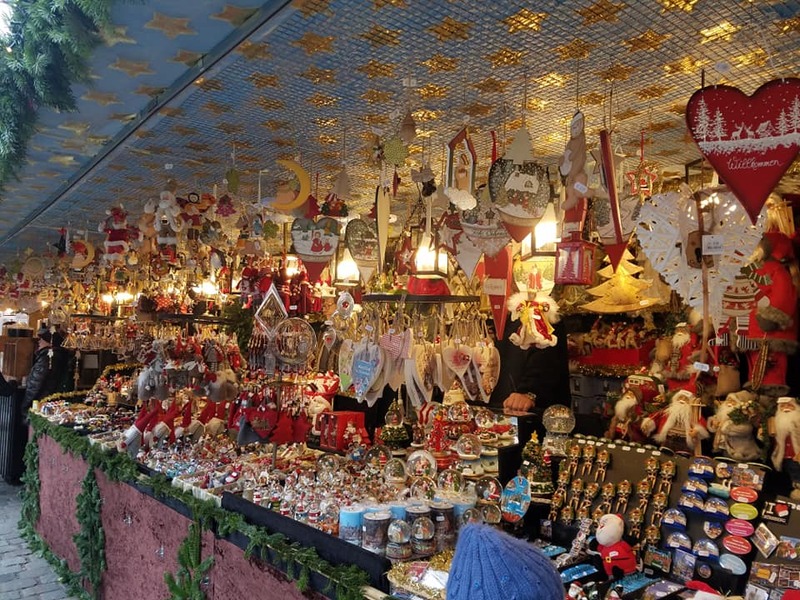 As soon as you approach a Christmas market, you feel transported to Santa’s workshop. Hundreds of booths line the walkways featuring handmade treats and trinkets. From wooden toys to wool sweaters, the handiwork of regional craftsmen draws you to touch and explore the details. Roasted nuts, grilled meats and chocolate smells fill the air. A trip to the market isn’t complete without sampling a few hot maronen – roasted chestnuts. Kids are giggling and scurrying everywhere as adults sip from custom mugs filled with glühwien, sweet mulled wine, or Eierlikoer punch, the German version of eggnog. Twinkling lights catch your eye from the independent booths to the united strands that meet at a focal point, often a star or angel, at the center of the market area. Christmas music and church bells sound throughout the festivals ensuring everyone feels the holiday spirit, or at least sings along with some carols. Scrooge, that old humbug, would say these Christmas markets are crowded. It’s cold, and often you’re walking in cold rain or snow. Parking is challenging, and you pay to use the toilets. Even with all those factors, I think even Scrooge himself couldn’t help but enjoy the markets which have been a tradition for hundreds of years. There is something magical with the transformation of a village square to a winter wonderland. The markets offer unique opportunities to purchase handmade gifts for those special people in your life. Create memories with children and loved ones as you partake in the various activities and foods. Taking part in local traditions makes you feel a part of something larger than yourself. Watching the live Advent calendar doors open, gazing upon live Nativity scenes or taking a walking tour of historic towns fills attendees with holiday joy. About the Author: Melissa Bitter is a freelance writer whose focus is primarily B2B marketing copywriting. She is currently living abroad with her family and often blogs about their travels and parenting. You can find additional articles and details about Melissa at www.mbprowriter.com. I love Christmas markets! Happily, the tradition is being adopted here in Canada, with a beautiful one now taking place every year in Toronto’s Distillery District.